We have a calm and dry week forecast for this construction week – which will be in contrast to the high winds and rain of last visit. 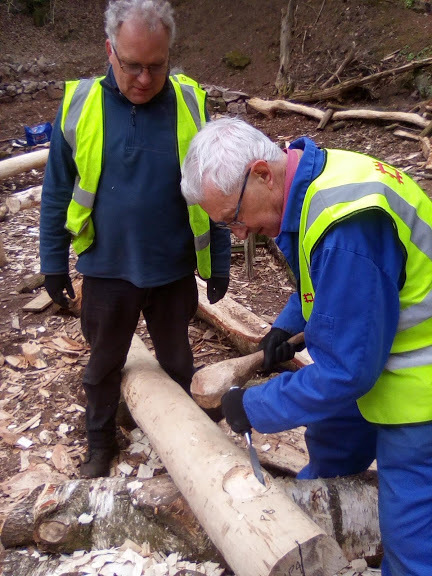 We are picking up where we left off with the erection of the final posts – and the preparation, shaping and installation of the wall plates that will link the post tops to form a strong support for the roof frame to sit on. 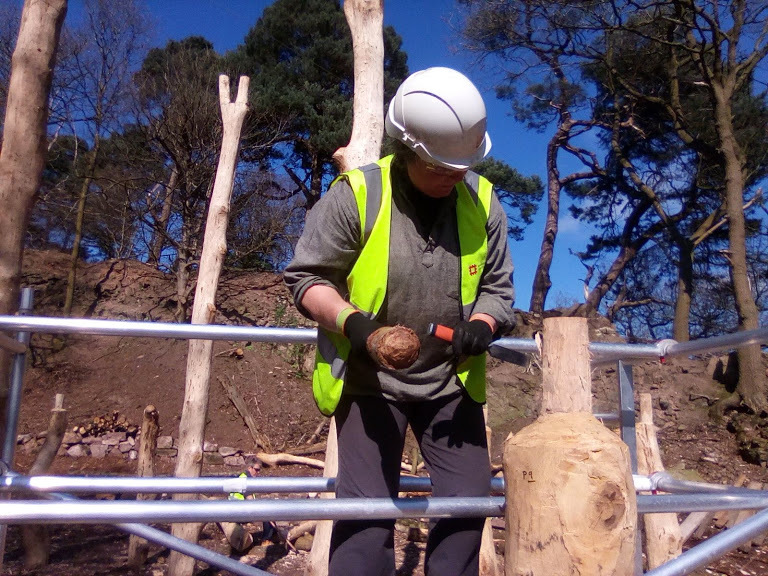 The placement of the first 8 wall posts last week raised a couple of issues that we will need to solve. The first is the issue of materials versus archaeological evidence. 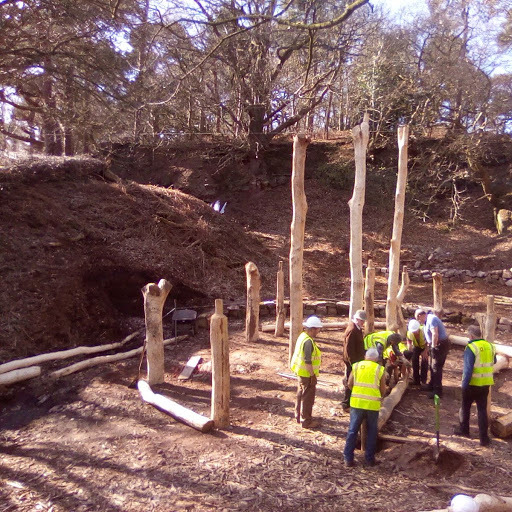 We are unable in 2019, to understand precisely some of the construction decisions made by those Bronze Age builders, simply because we no longer have access to the specific timber that was available to them. 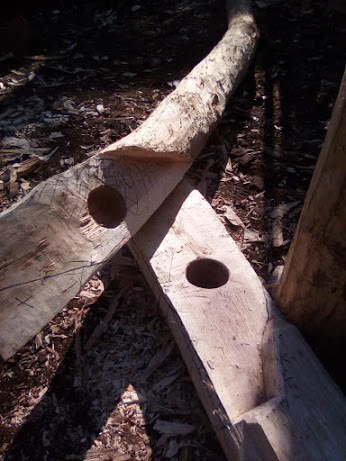 In consequence, we are faced with post holes that require very particular shapes of wood to join them together, and although we might understand what those specific pieces of timber would look like, and what dimensions they would have been, we do not have the luxury of hunting through the local forests to find them. Such an issue faces us between Posts 8 and 9 (the proposed door location), where the span of the gap between posts would require a very particular shape of timber to maintain a doorway, span the posts, and keep the roof pitch at a feasible pitch. This is not available to us, and so I have looked again at the evidence to see if any solutions offer themselves to us. As it happens, the evidence shows a posthole (F28) that sits at the very centre of this span – and would support two wall plates in exactly the right place – but which has a later infill. 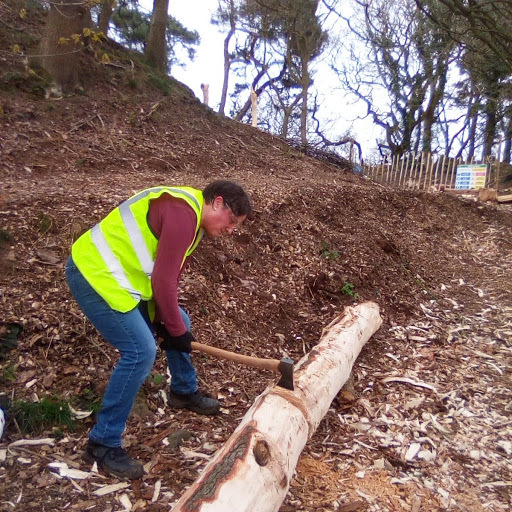 The arguments surrounding the use of this post hole are many and endless, but at this stage, and given our constraints in material selection – imposed by our modern landscape – I am happy to go ahead and place F28 as a structural post. We now face the challenge of selecting wall plates to span the gaps between posts, and to mortise and tenon them so them overlap each other, fit well, and provide the correct support height for the rafters to achieve their pitch of around 45 degrees. 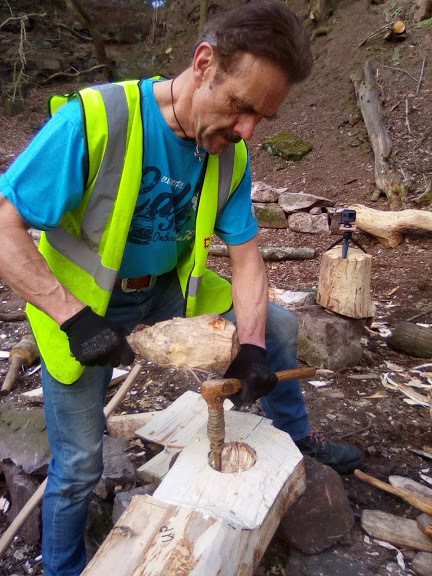 This work has been carried out with bronze tools in places, to test the time and effort required to produce accurate circular mortises in both Ash and Oak timbers. 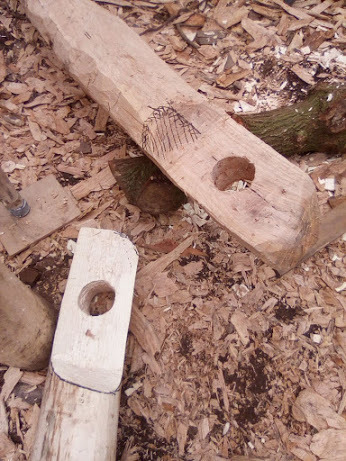 Each mortise effectively cuts through one half of each log, allowing two timbers to overlap and the mortises to match. Measuring and marking out is critical at this stage to limit any errors to a minimum. That said, even the most carefully measured joints will inevitably require adjustment once we begin to fit them into position. 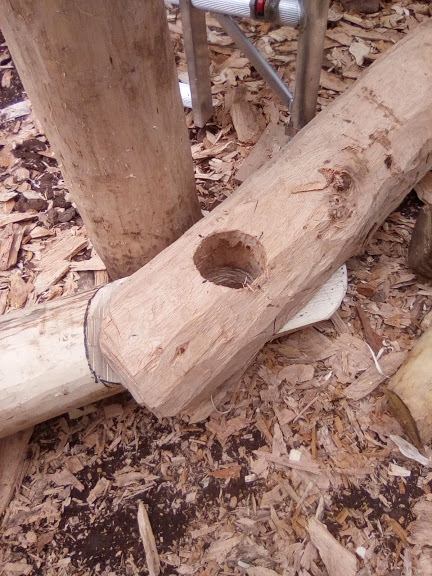 This is done approximately on the ground first, overlapping the timbers at somewhere near their correct angles and matching the mortise holes. We have also solved a remaining issue with the post positioning. The gap between posts 10 and 1 is wide (over 4 metres) and relies on the installation of a long and very bent wall plate to maintain the imaginary circular line of the walls. Our available materials do not give us the freedom to achieve this, so we have to solve this problem in another way. 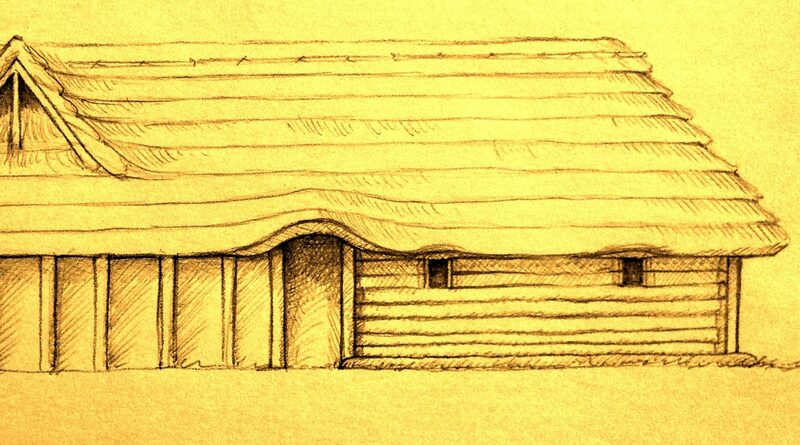 My solution is to place a Prop at mid point between the posts, but on the imagined carving line of the walls that will maintain the roof pitch at around 45 degrees. This prop will sit on a pad stone and be linked to posts 10 and 1 with two mortised wall plates. 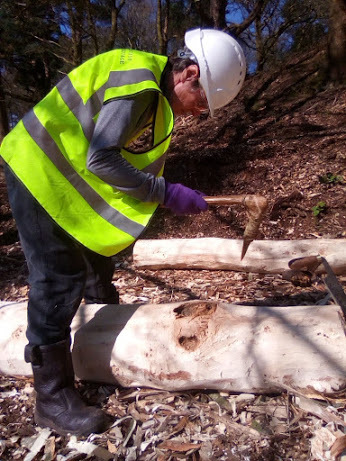 I suspect this issue is one of available materials, and at least our solution will not change the available archaeological evidence – in terms of post holes that weren’t there! The sound of mauls hitting chisels, axes, bronze tools and wooden wedges fills the air as teams of volunteers split larch Larch logs in preparation for furniture and interior fittings, trim the tenon pegs to size on the post tops, cut deep circular mortises into our remaining wall plates, and hew the tricky half joints that will allow the wall plates to meet as pairs over each post. Our aim is to prepare and match the wall plates on the ground first, and then to have a couple of lifting days when the building will lurch forward again in visible progress!